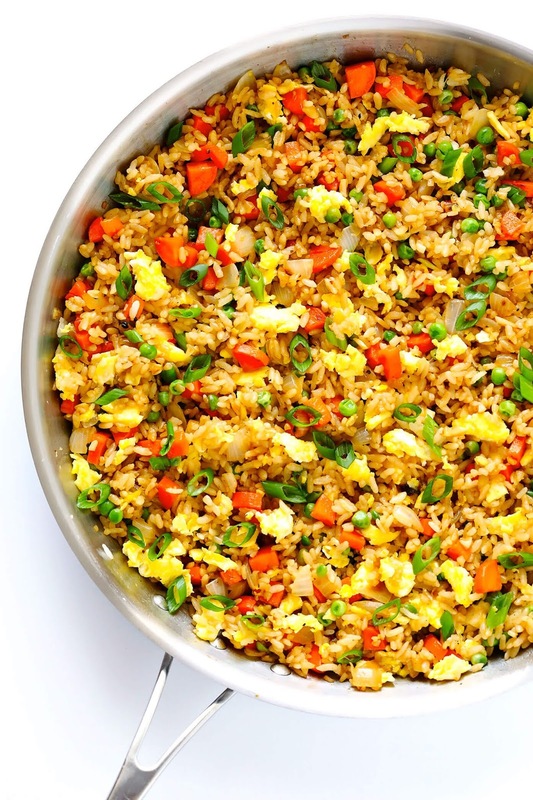 This Chinese restaurant-style fried rice recipe is the absolute BEST. It’s quick and easy to make, customizable with any of your favorite mix-ins, and so irresistibly delicious. Hey guys! I’m digging back into the blog archives today to share one of my all-time favorite recipes with you again. And I really do mean all-time. Like specifically, back to my picky-eating days that lasted — oh — until college, when I was totally “that girl” who refused to even look at anything else on the menu at a Chinese restaurant besides fried rice and my trusty egg drop soup. Guys, I was crazy about my fried rice. And this was thanks in large part to our amazing little neighborhood Chinese restaurant that knew how to fry up a mean batch of rice, and set the bar high for what I expected fried rice to be. I mean, back then, I just assumed that all fried rice was perfectly stir-fried and full of big flavors and irresistibly delicious! Little did I know about the painfully bland, boring, and tasteless stuff that I would encounter at too many other Chinese restaurants once I ventured out of the nest. Even today, I still can’t believe it when I stumble across a bad batch. Such a missed opportunity! Anyway, I figured out pretty quickly once I left for college (in a small town with zero good fried rice) that this was a problem I was going to have to remedy in my own kitchen. So over many years and literally dozens of test batches, I finally landed on my favorite recipe back in 2014 that has been my go-to ever since. It’s surprisingly speedy to make, easy to customize with your favorite add-ins, and more flavorful and amazing than any take-out I’ve ever ordered. And it’s all thanks to a few simple tips that hundreds of readers have agreed totally work. Ok, let’s get right to it. Here are the important things I have learned over the years about how to make the best fried rice. 1) Use cold rice: You’ve gotta plan ahead and use thoroughly-chilled cooked rice. 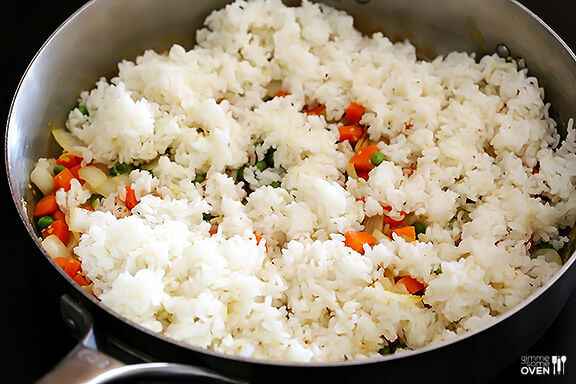 A fresh batch of warm (or even lukewarm) rice will not fry well when it hits the hot pan, and will result in soggy and sticky clumps — no good. So leftover refrigerated rice is ideal! Or, if you are in a hurry (or have an impulse craving for fried rice, which I completely understand 😉), just cook up a fresh batch of rice. Then spread it out on a baking sheet or another large flat pan, drape the rice with a layer of plastic wrap, then pop it in the fridge for 30 minutes (or in the freezer for 10-15 minutes) until it is thoroughly chilled (not frozen). 3) Use veggies: This is one of my big pet peeves with lame take-out fried rice — not enough veggies! 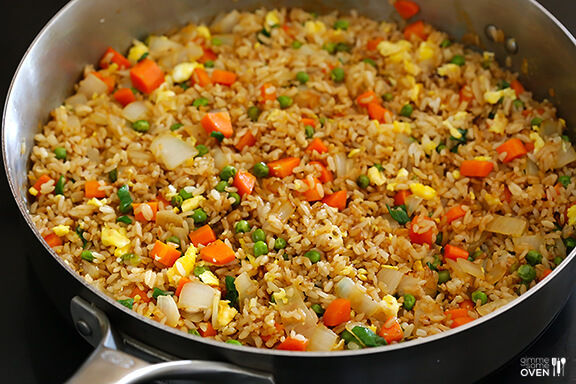 In addition to adding some nice spots of color, veggies go a long way in adding some flavor and freshness to fried rice. Our local Chinese restaurant always added both white and green onions, too, which I included in this recipe. But feel free to modernize this recipe with some other delicious stir-fried veggies as well! 5) Use high heat: This will help fry and brown the rice and veggies well, and will also help prevent the rice from steaming in the pan and sticking together too much. 6) Don’t be afraid to add in some extra soy sauce at the end: I know that everyone has different sensitivities to salt, and different brands of soy sauce also contain pretty dramatically different levels of sodium. So I went a little light on soy sauce in the recipe below. But please add more at the end if this tastes good to you. I almost always stir an extra drizzle into my portion and love it. Cooked, chilled rice: Any kind of white or brown rice will do. Just be sure that it is cooked (I always cook mine in this rice cooker, which works like a charm) and thoroughly chilled (in a sealed container in the refrigerator) before adding it to your hot skillet. Again, freshly-cooked rice will not work well in this recipe. Eggs: Which add great flavor, texture and protein. Carrots, onions, green onions and peas: This is the base mix of veggies that I always use for fried rice, but feel free to add in other stir-fry veggies you love (see ideas below). 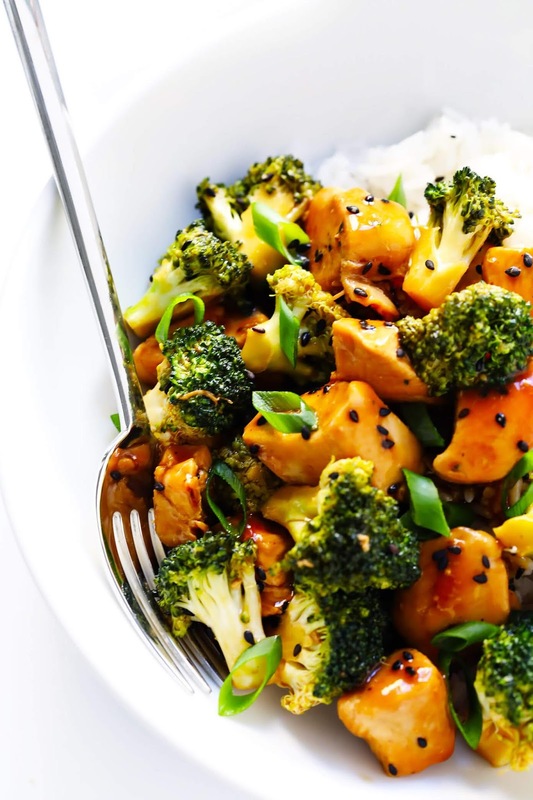 Soy sauce: I created this recipe using low-sodium soy sauce. So add less if you’re using traditional soy sauce. Oyster sauce: This is a major flavor booster in fried rice and (don’t worry) doesn’t taste like oysters. You can find it in the Asian section of grocery stores, or order it on Amazon. Toasted sesame oil: The finishing touch in this recipe, which is a must. You can also find it in the Asian section of grocery stores, or order it on Amazon. 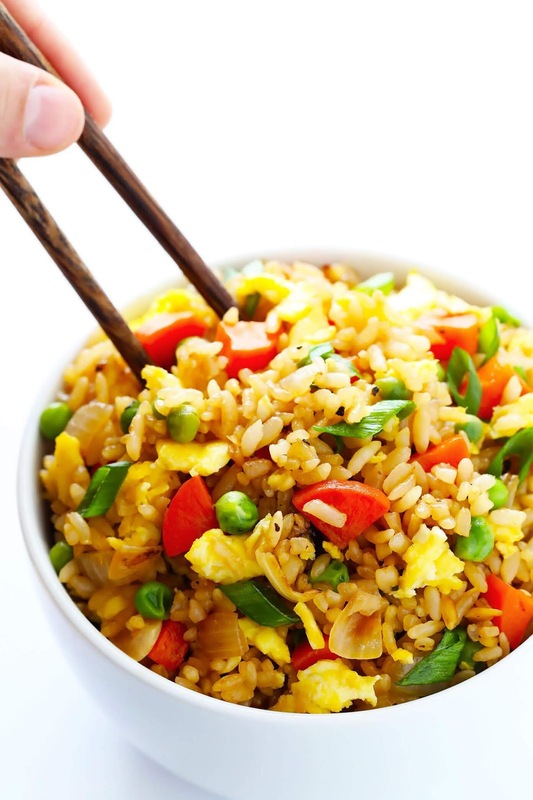 Butter: My favorite way to stir fry rice. Scramble your eggs: Using a small pat of butter, scramble some eggs in a large sauté pan, breaking them into small pieces as you go. Then transfer the eggs to a separate plate, and set aside. Sauté your veggies and garlic: Return your sauté pan to the heat, and sauté the onions, carrots, peas and garlic until soft and cooked through. Stir fry rice: Then turn the burner to high heat. Scooch the veggies over to one side of the pan, melt the remaining butter in the other half, and add the chilled rice, soy sauce, and oyster sauce (if using). Then stir to combine with the veggies and continue sautéing the rice, stirring every 15-20 seconds or so for 3 minutes, or until you notice the rice and veggies starting to brown slightly. Remove pan from heat. And stir in your green onions, sesame oil, and scrambled eggs. Taste and season. Give the rice a taste, and season with salt and pepper, plus any extra soy sauce or sesame oil if needed. 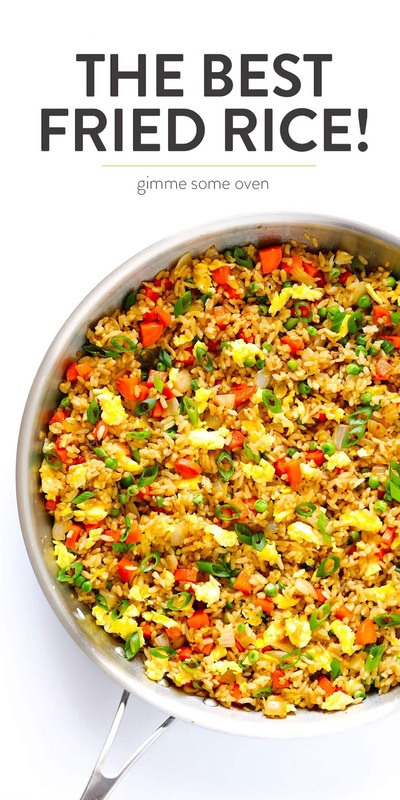 Chicken Fried Rice: You can either sauté some chicken in a separate sauté pan while making your fried rice. Then shred or dice and add to your fried rice. Or for a shortcut, I like to shred a rotisserie chicken. Or even better, shred leftovers from my favorite baked chicken breasts recipe. Pork Fried Rice: Sauté a boneless pork chop in a separate sauté pan while making your fried rice. Then dice and add to your rice. Beef Fried Rice: Sauté steak or brown ground beef in a separate sauté pan while making your fried rice. Then crumble or dice and add to your rice. Shrimp Fried Rice: Sauté half a pound of peeled, raw shrimp in separate sauté pan while making your fried rice. Then add the shrimp to your rice. 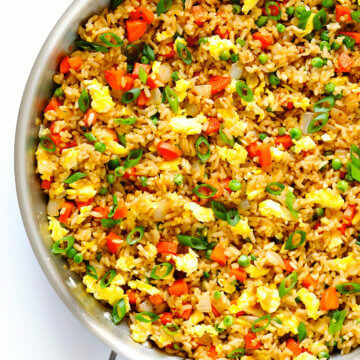 Vegetable Fried Rice: Any stir-fry friendly veggies would be great in fried rice! Just sauté at the same time that you cook the onions, carrots, peas and garlic. Then stir to combine with the fried rice. Kimchi Fried Rice: Fresh kimchi adds a major flavor boost to fried rice. Just chop and stir it in to make kimchi fried rice. Pineapple Fried Rice: Fresh pineapple can be traditional in Chinese or Thai fried rice. Just chop and stir it in to combine. Fried Brown Rice: For a healthier twist, feel free to use cooked brown rice in this recipe instead of white rice. Quinoa Fried Rice: Here is my favorite recipe. This 12-Minute Chicken and Broccoli recipe pairs perfectly with fried rice. 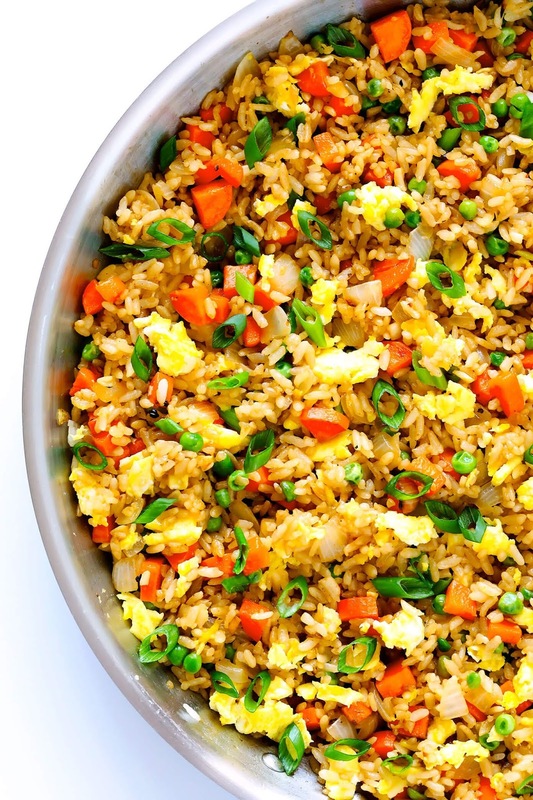 Learn how to make fried rice with this classic recipe. It only takes 15 minutes to make, it’s easy to customize with your favorite add-ins, and it’s SO flavorful and delicious! Heat 1/2 tablespoon of butter in a large sauté pan over medium-high heat until melted. Add egg, and cook until scrambled, stirring occasionally. Remove egg, and transfer to a separate plate. Add an additional 1 tablespoon butter to the pan and heat until melted. 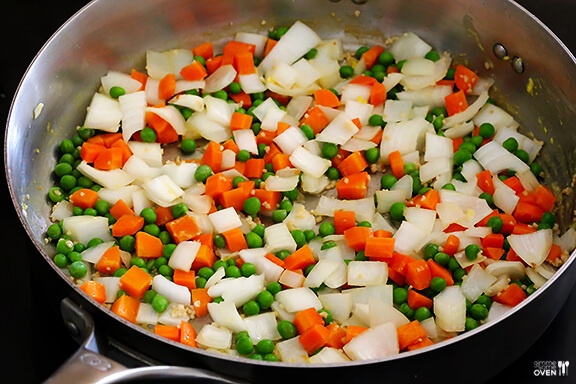 Add carrots, onion, peas and garlic, and season with a generous pinch of salt and pepper. Sauté for about 5 minutes or until the onion and carrots are soft. Increase heat to high, add in the remaining 1 1/2 tablespoons of butter, and stir until melted. Immediately add the rice, green onions, soy sauce and oyster sauce (if using), and stir until combined. Continue stirring for an additional 3 minutes to fry the rice. Then add in the eggs and stir to combine. Remove from heat, and stir in the sesame oil until combined.